While in exile on St Helena, Napoleon dictated a commentary on the wars of Julius Caesar, later published in 1836. In each chapter he summarized the events of one campaign, then added comments from the standpoint of his own military knowledge. Over the nearly two millennia between Caesar and Napoleon some aspects of warfare had changed, notably the introduction of firearms. But much remained the same: the rate of movement of armies (at the foot pace of horse or man); human muscle power as the main source of energy for construction work; some military techniques, notably bridge construction; as well as the actual territory fought over by Caesar and later by Napoleon. 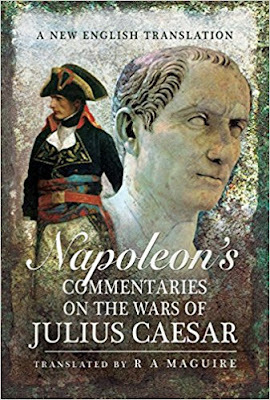 Napoleon's commentary thus provides a fascinating and highly authoritative insight into Caesar's wars, as well as providing a window into Napoleon's own thinking and attitudes. Napoleon in places detects mistakes on the part of Caesar and his enemies, and says what they should have done differently. Remarkably, this is thought to be the first full English translation of Napoleon's work. Napoleon Bonaparte was born to an obscure Corsican family but rose through the ranks of the French army to become Emperor of France, conqueror of most of Europe and acknowledged military genius. He wrote this book while in exile on St Helena.The translator. RA Maguire, is a former civil engineer with a longstanding interest in military and ancient history.